Choose an 18th Century handwoven rug from the highland villages of the Caucasus Mountains. Archaic shield pattern borders and a strong central medallion design are characteristic of this period. 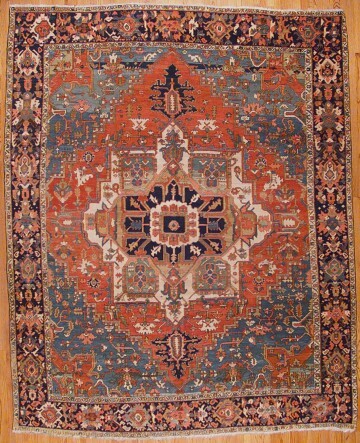 Lustrous hand-spun wool pile contributes to this rug’s excellent overall condition. Deep medium to lighter blues surround coral, gold and ivory accents. This antique Serapi can hold its own in spacious rooms with large-scale furnishings.